Preheat oven to 350° F. Place granola bars into food processor or blender and process until you have fine crumbs. 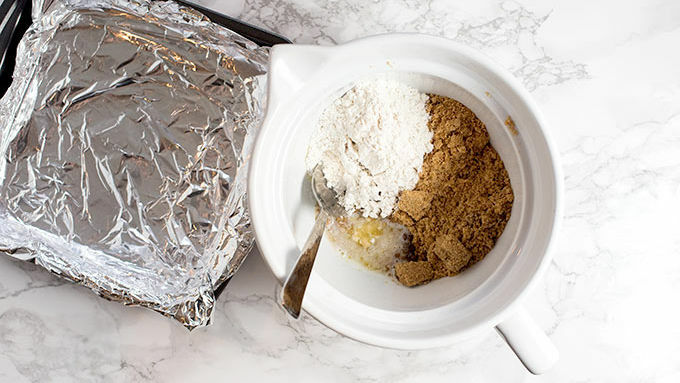 Add 1/2 of the crumbs to a bowl with flour, melted butter, and brown sugar. Stir to combine. Press crumb mixture into an 8x8 pan lined with parchment or foil. Bake for 10 minutes and allow to cool. Spread blueberry yogurt over cooled crust and top with blueberries. 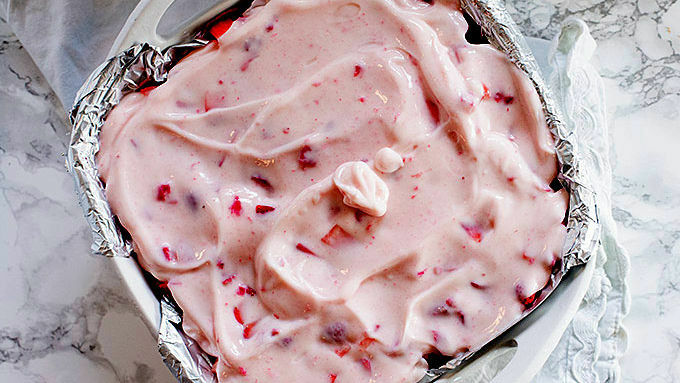 Spread vanilla yogurt over blueberries and top with diced strawberries. 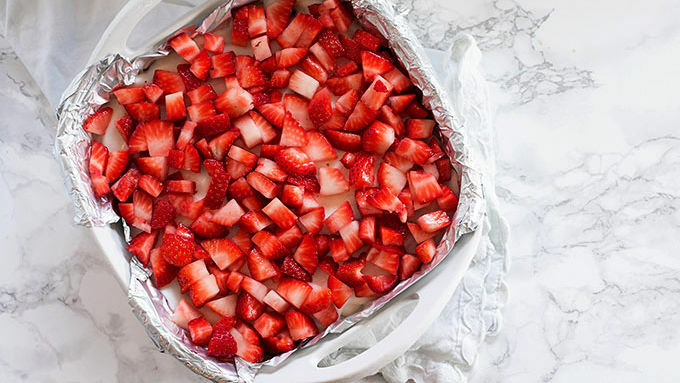 Spread strawberry yogurt over strawberries. 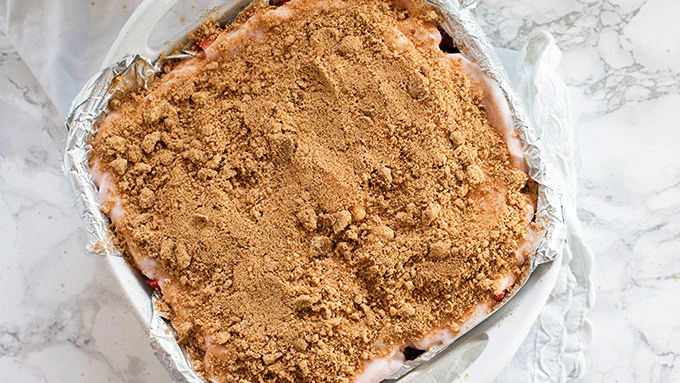 Sprinkle the remaining granola crumbs over the top and freeze for 4 hours. Let sit on the counter for 5 minutes to soften slightly before cutting. For more uniform layers, freeze each layer for 30 minutes before adding the next. I don’t know about you, but I’m currently only eating frozen food. I mean, have you been outside? Hot. With a capital “h.” I can’t deal with this weather. Sure, I complain all winter and can hardly wait for summer to come along, but once it hits 80 degrees, I start wishing for winter. Don’t I sound like a delight to be around? In order to keep my sanity, and to help my friends from hating me, I eat a lot of frozen treats. They cool you off in the most delicious way, you know? 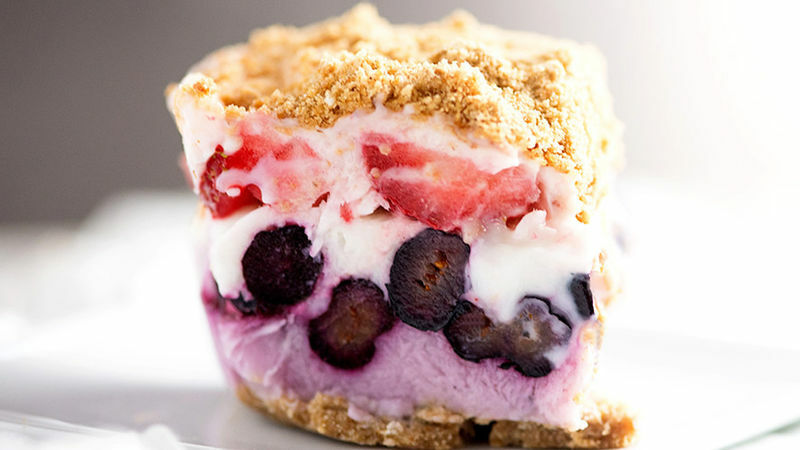 The 4th of July is coming up, so let’s get all festive with our frozen desserts, shall we? Oh, and look. This is just granola bars, fruit, and yogurt, so if you wanted to eat this for breakfast, you have my blessing. 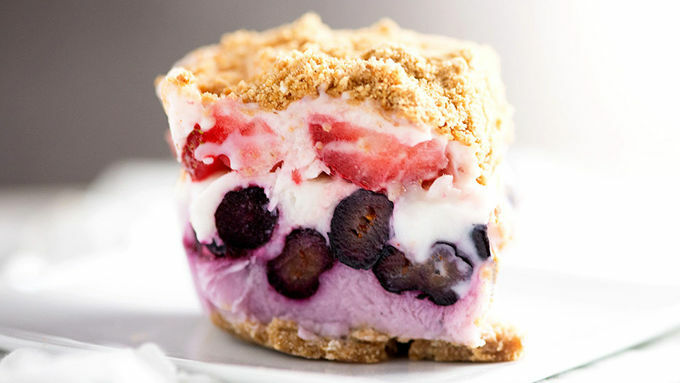 You’re going to want a bunch of yogurt, some granola bars, and plenty of blueberries and strawberries. How easy is this sweet little treat?